Veins get a bum rap. We only notice them when they’re not working properly (i.e., varicose veins), but our veins are all-star workhorses for the body, unrelenting blood circulators that keep us alive and well. Our underappreciated vessels are actually super cool. Here are some interesting facts related to our blood vessels. Brain freeze starts in your mouth! According to the National Institute of Neurological Disorders and Stroke, when something cold like ice cream or a slushy touches the warm roof of your mouth, local blood vessels constrict to minimize heat loss, then relax to restore blood flow. This response triggers a burst of pain that may last for a few minutes until the body adapts to the sudden change in temperature. Your blood vessels could circle the globe—more than twice! 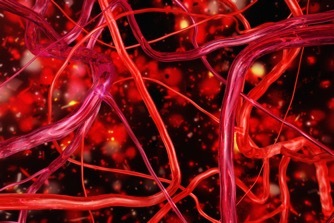 Your blood vessels form a complex network so intricate and vast that it measures more than 60,000 miles in length if you were to lay out your blood vessels in a line, according to the National Institute on Aging. Every day, your heart pumps about 1,800 gallons of blood through your blood vessels. This amounts to millions of gallons of blood over the course of a lifetime. Go ahead; blame the weather. Your blood vessels form your circulatory system, which helps to maintain your body temperature. Blood vessels literally respond to fluctuations in temperature, expanding to release heat and cool you down in hot weather while constricting and narrowing to conserve heat when you’re cold. Dr. Surya Challa is a board-certified vein specialist and surgeon who is renowned for his surgical skill and treatment of varicose veins, spider veins, and a number of vein-related conditions. For more information, call 757.663.5461 or schedule your free consultation today!